The park was clean and the service was good. Restrooms were clean and maintained, except near the marina. The only downside was that the park has no dump station, so we had to find a fuel stop on the way home to dump our tanks. For the price paid I would expect them to be available. Make sure to get a full service site when you check in or you'll leave with full tanks. We camped at Disney's Fort Wilderness Resort & Campground in a Travel Trailer. I guess the only reason you would stay here is if you were going to one of the Disney parks. Our spot was hard to get into to start with. You receive a lot of cable channels but most are scrambled for some reason. The park is very noisy. The sites were close together in the loop I was in. Oh and the price. We camped at Disney's Fort Wilderness Resort & Campground in a Motorhome. Women had two and three children in the handicap shower stalls giving baths and handicap people were unable to use. The park is noisy until around midnight and then it calms down. Around 5 AM it's very loud again. Car horns, kids yelling. Everyone up early for the 6 AM and 7 AM park openings. If your doing the Disney thing all day it will work for you. If you just want to enjoy camping choose another campground. We camped at Disney's Fort Wilderness Resort & Campground in a Motorhome. Made reservation (6 months in advance) for a 3 week stay, and commented I had a big rig and wanted a satellite friendly site if possible. Must not have been possible. Site was long enough, but had to negotiate a fence on one side of site and metal poles (6 inches at most on each side) protecting a transformer on the other side in order to back into a site that had tree limbs touching each side of rig. Forget satellite. Cable didn't work either, maybe due to having to use an extension coax to reach and signal loss. Golf carts EVERYWHERE and evidently once you get out of your car you leave common sense there rather than use it operating a golf car. All of the staff was extremely friendly, but won't be back. We camped at Disney's Fort Wilderness Resort & Campground in a Motorhome. We frequent this campground on a regular basis, on the better part of 20 years. We are DVC Members at Disney and for some reason that always seems to throw a wrench in the cogs when it comes to the reception part of our trip. We follow the rules and book accordingly, get all the pre work set.... and ten days before we call to confirm what site area we are interested in. We choose the premium sites and a particular loop... all is said and done and we think all will go well once we arrive. We arrived a day early but were still staying for almost 3 weeks.... this seemed to confuse the front desk (as always).... because a couple hours earlier my wife was in contact with them as we drove closer. Once we arrived we were told that all the Pre work that was done.... was all for naught. We were told we could not have the loop we requested because there was to be tree trimming on that loop. So, we took the loop next door and observed the loop to see if it really was going to be emptied for the work. We observed at least 5 RVs that never left that loop, yet we were told we could not stay on that loop. As usual, the rules change with who is ever on the clock that day and this truly put a sour taste is our mouths. So much for having a Disney day ??? The campground as a whole is beautiful.... lots of work going on... but only during daylight hours. DO NOT LET THE FRONT DESK CHOOSE your camp site... only YOU know your RV and where you feel comfortable backing into. We did a drive around with RV in tow to see, but because we are here often we kinda know where to go. I gave the Value a satisfactory because we feel we are treated as 2nd class citizens because we are DVC members... but know that our point are turned into $$$ so it shouldn't matter. Cleanliness was also good but construction was everywhere. We haven't received our survey from Disney yet... hmm ?? Wonder why? Research the area you are interested in.... and when you get there check all your options before choosing. Do not be afraid to let them know how you feel.... once we heard that they have a computer choose your site... my comment was "I drive, NOT the computer" and who ever came up with this system, needs to flush it and get more input from campers ..... NOT computers We camped at Disney's Fort Wilderness Resort & Campground in a Fifth Wheel. I honestly was very disappointed with our site and our stay. Having stayed in several Disney resorts over the years, and now owning an RV, I expected the same level of quality and cleanliness previously experienced. Upon arrival our site was not clean, littered with bottle caps, cigarette butts and branches. We were on loop 200 and all sites were crowded and very sandy. WiFi didn't work at all! Meadows pool recently started closing at 8 pm, way too early. Ole Swimming hole was open late, in theory. The pool was closed the entire 7 nights of our stay I was told there was a mechanical issue. That happens so open Meadows later. Kids want to swim!! The common areas and grounds were much nicer than the sites we saw and more up to standards. Nice area to bike ride. Bus transportation was good. Boat transportation varied. Very long waits at times while other resorts were getting prompt boat service. I do like that large families can be accommodated here unlike many Disney resorts...(our group rented two sites however). We were told that other loops have much more space and did not experience the debris we did, but this is where we were placed and were told the park was full. When I voiced my concerns a manager said "give us another chance". I honestly would like to in the hopes that it would be a better experience, as overall there is a nice feel here. We camped at Disney's Fort Wilderness Resort & Campground in a Motorhome. I am going to go against the grain with this review. We just got back yesterday (Nov. 2) and am really disappointed with the campground. I will say first of all that the campground and site were awesome. Campground beautiful and well kept (as expected at Disney World). But, my problems are with everything else. The bus system to the parks and other resorts are incredibly difficult to figure out. Nobody ever told us that it would be in our best interest to rent a golf cart. The staff didnt seem to be RVers themselves. The really good campgrounds across the country are owned and managed by real RVers that know the issues we will face and anticipate those. The staff had no empathy for camping issues. Another issue I had was the lack of camper related replacement parts or accessories in either of the trading posts. The bath houses had those stupid motion sensor sink faucets and no hot water so I couldnt shave. Next time we go to Disney we will be staying at an off property campground. Not worth the money. We camped at Disney's Fort Wilderness Resort & Campground in a Tent Trailer. I will say that yes the campground is convenient, its clean, and they have a lot going on for kids. However, we did not like it at all. We requested a premium non pet loop, 1200 or 1300, 9 months ago. When we arrived they gave us the 600 loop which has no trees and is a pet loop. After some complaining they moved us to our original request. We stayed in site 1332. When we arrived the site smelled of sewer. The staff came and hosed the site down again which helped some. The other problem was the sites are not very wide at all. They are long enough to fit our 36 ft TT, but the two slide outs were in the bushes. The interior roads are pretty narrow too, but are manageable. Don't plan on driving to anything inside the campground, because they don't have parking spots at any of the attractions such as pool, or marina. They make you ride the bus or rent a golf cart. Can you say scam? We were not impressed at all, and for 78.00 it was somewhat of a rip off. We will not return to this park as there are much better places to stay for the money. If your goal is to use this a base camp to visit all the parks, then it will work. 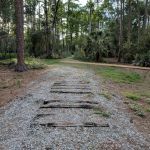 We camped at Disney's Fort Wilderness Resort & Campground in a Travel Trailer. It had been about 10 years since we were last in this campground and it hasn't changed much. Still a very clean, kept up campground and huge. Only negative from us was the amount of pets, dogs. It seemed there were more of them then children. A few days before we arrived, our "new" neighbors said a site with tents put up (1600 Section) were allowing a large dog to run loose. They called Security and was told, "do you want us to change your site?". That is not the answer I would want to hear, it would have been, I want you to refund my money and leave. While we were there another group of people took over the same site with a different large dog and let him also run loose, chasing the wild turkeys and scaring neighbors with small dogs. You would think Disney would have a little more control on that type of situation. Maybe make a couple of sections no pets. We won't go back for a long time. While we did not go into any of the parks while visiting, we did use the convenient buses/boats and monorails to sight see. Also, some of the sites in the 1800 section are very tight on backing in. We had a tough time but made it in and another camper came in at dark and could not get in without people moving vehicles across the street. I suggest arriving in the daylight. 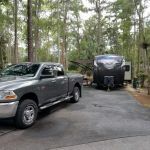 We camped at Disney's Fort Wilderness Resort & Campground in a Fifth Wheel. Ok I know I'll probably get hatemail from Disney lovers but I did not enjoy my time at this campground. The sites (premium even!) were very tight and close together. We questioned whether we were in a premium site after we saw it. There was little greenery between us and our neighbor. The activities were accessible only with a tram at a long-waiting stop, bike, a very long walk, or your own car. We ended up driving to all of the parks. We've stayed at some of the resorts in years past and thought we'd save money by taking our RV. Now in addition to being a huge Disney lover, I am also a huge RV fan. However, I don't think I'd take a vacation in our RV at Disney again. The sites were clean, just super crowded and far away from everything, not easy to get around to the activities/events/parks. We paid for a "premium" site but I seriously doubt it was premium. We even left a day early: and YES I do love Disney. 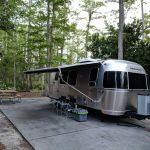 We camped at Disney's Fort Wilderness Resort & Campground in a Fifth Wheel. This was our second stay at Fort Wilderness; we stayed here 4-5 years ago and wanted to go back to the parks. We were so disappointed this time. Mostly due to the noise. There was incessant dog barking for our entire 10 days. We were in a pet loop because we have a dog. It is extremely unfair to those of us who have quiet, well behaved dogs, to have to put up with that day and night. A lot of people had 2-3 (mostly small rat dogs) and they do absolutely nothing about it. They are either oblivious to it, or simply don't care about their neighbors. I fault the park for this. My sister and brother were here a month before us; they were stuck into a pet loop for 10 days and they don't even have a dog. They were beside themselves with that. The other thing is the extreme noises from campers themselves, specifically the kids. The parents let their kids terrorize the streets. We had no peace except when we went to the parks, which is a whole different rip-off story. We will not be back and will not recommend this park. We wasted $2,000 and 10 days to listen to barking dogs and out of control children. Wow. What a vacation. We camped at Disney's Fort Wilderness Resort & Campground in a Motorhome. Very pretty campground and plenty to do for families. We paid for a premium site but did not feel we received a premium site. Although it was long it was narrow, picnic table was in the back of the RV. Right next to the bathroom so we had a lot of traffic. However we were located very near the sidewalk to pick up shuttle buses or walk down to the Trails End restaurant. We didn't have any difficulty getting into and out of our campsite but did hear some bangs from larger MH's leaving. A unit must be rented out to receive cable and Internet, although you get the money back when you turn in the box the system is a pain to deal with setting up and we had wires running everywhere. This campground is nice to see the parks but Disney will nickel and dime you. We won't be back unless grandchild comes along. We camped at Disney's Fort Wilderness Resort & Campground in a Motorhome. I would think that Disney would do anything they touched right: including camping. They just did not have everything well organized when we got here. Check-in was a hassle, and a site wasn't available any earlier than check-in. The park was clean, of course and the amenities were great, but lackluster compared to the rates. Can be a stressful park to navigate and feel settled in. 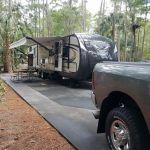 We camped at Disney's Fort Wilderness Resort & Campground in a Travel Trailer. Low rating due to the fact that we're not Disney people (we were there to see friends), plus exhorbitant cost for what you get: cheek-to-jowl parking, way too many people per site, lots of noise, swarms of mosquitoes (and a prohibition against "burning devices" so no Citronella candles for us), very tame squirrels which tormented our dog so that we had to keep him inside, and rules, rules, rules. The sites were level and we did enjoy the very convenient and extensive recycling and the very clean restrooms. Just can't justify the $100 per night. Can't. And then they charge $ for the ice, even though they make all these claims that campsites are just like resort rooms at the hotels, where, I think, the ice is free. I'm sure if you have children and are there to see the theme parks, you'll love it. But as a camping experience, ick. We camped at Disney's Fort Wilderness Resort & Campground in a Motorhome.